This is part 3 in a series on the theology behind house churches. To see the other posts in this series you can find a link to them at the bottom of this entry. As stated previously, these posts are about the nature and practices of the ekklesia. They are not meant to be taken as a criticism of the people of God regardless of how anyone chooses to assemble. Today’s post is all about the Lords supper and we will start off with some of the basics and move on from there. This is a familiar passage to most of us where we see Jesus instituting the Lords supper the night before His death. From there on it was passed down to the church by the instructions of the disciples (1 Corinthians 11:2). When we gather for the Lords supper we are remembering Christ's death (past) and the new covenant (present) which we proclaim until His return (future) (1 Corinthians 11:26). It is also possible that the Lords supper i a type and shadow of the marriage supper of the lamb (Revelations 19:6-9 cf Isaiah 25:6-8). I have heard it said that when Jesus said “Do this in remembrance of Me”, the Greek allows for it also to be interpreted as “Do this as a reminder to Me”. Similar to Genesis 9:12-15 where God makes a covenant with Noah and uses the rainbow as a sign and a reminder to Himself of the covenant that He has made with man. Regardless of if one accepts the case for the connection to the marriage supper of the lamb, there still remains a definite past, present and future aspect to our partaking of the Lords supper. The wine which we drink (or grape juice) is symbolic of Christ’s blood which initiates (I’m sure there is a better word than initiate but my brain is tired) the new covenant (Matthew 26:28) and it reminds us of the cleansing power of His blood for the remission of sin (1 John 1:7). An interesting side note on the bread and wine is that just as Jesus is food and drink to us, many scriptures tell us that the Father is food to the son (Matthew 4:4, John 6:27, 57). So far there is not much that separates organic churches and institutional churches regarding the Lords supper. The difference between the two is more a matter of orthopraxy than orthodoxy. House churches generally celebrate the Lords supper as a full meal which incorporates the bread and wine into it for the reasons that follow. Firstly, in 1 Corinthians 11:20 while Paul is rebuking the saints in Corinth he says, “Therefore when you come together in one place, it is not to eat the Lord’s Supper”. Two things regarding this verse, the first is that it offers a glimpse into what the early church did when they gathered together which was to eat the Lords supper. The second thing is that the word deipnon in this passage literally means ‘dinner’. Almost everyone agrees that the first Christians would gather as often as possible for their main meal of the day to celebrate communion together. Those first believers called it the love feast (Jude 12). Some early manuscripts also mention the love feast in 2 Peter 2:13 and we also see it in the writings of many of the early church leaders such as Ignatius of Antioch, Tertullian and Clement of Alexandria. There is ample evidence that communion was taken as part of a full meal in scripture (Acts 2:46, 20:11 and 1 Corinthians 11:20-22). These covenant meals in the bible, whether the Lords supper or those under the first covenant were eaten in the presence of the Lord (Exodus 18:12, Deuteronomy 12:7, 18, 14:23, 26 and Luke 22:15). Whether Old or New Testament, all covenants were concluded, renewed and remembered with a celebration meal (see Genesis 26:26-31, Exodus 24:7-11, Ezra 6:16-22, Nehemiah 8:9-10, 1 Corinthians 11:25). The sacrifice establishes the covenant and then the meal celebrates it. Thus when we partake of the Lords supper in our homes, it is not a solemn occasion as if we are remembering a loved one at a funeral. John 16:20 says, “Most assuredly, I say to you that you will weep and lament, but the world will rejoice; and you will be sorrowful, but your sorrow will be turned to joy.” How beautiful! This is exactly what we see in Acts 2:26 where the church was “breaking bread from house to house, eating their food with gladness and simplicity of heart”. Yes, Christ’s death was brutal and a horrific injustice but He has conquered death (Romans 1:4 and Revelations 1:18)! Our sorrow has been turned to joy knowing that our Lord is alive and reigns! It is not a time for solemnity, sadness and guilt; just like we see with the OT covenants and meals, it is a time of celebration over the fact that a covenant of peace has been made between two parties. While the love feast is completely foreign to most churches in the 21st Century, the bread and wine partaken of in communion is not faring much better. It is certainly not what the church gathers for any longer. Most churches no longer think of it as a big deal and held communion services maybe only 12, 6 or 4 times a year. One of the churches that I used to attend could serve a sip of juice and a piece of bread the size of a marble to 2000 people in less than ten minutes. Those ten minutes would include a song about the cross, a few seconds of silent reflection and a quick prayer. How sad. On a bit of a side note, the idea of examining oneself to see if people were worthy of partaking of the bread and wine actually comes from John Calvin. Certainly, we should examine ourselves, live righteously and confess our faults to one another but this is not at all what 1 Corinthians 11:20-34 is teaching regarding communion. If we read the context of Paul’s words in verses 28-29 it is plain that he was chastising the Corinthians for not being charitable and considerate towards their brothers and sisters in Christ. People were getting drunk on the wine and finishing the food before some of the people would even arrive. Thus making a mockery of what the meal represented. The specific point Paul had taken issue with here is that they were not discerning the Lords body (v29). So how did we go from a joyful feast which bore witness to our corporate unity in Christ and celebrated the new covenant to a priestly ritual observed in silence and personal reflection? As far as I can see there was no big event that changed everything but rather a gradual separation of the meal from the bread and wine between the mid second and third centuries. By the fourth century the separation was complete as love feasts were no longer convenient with the churches now meeting in consecrated buildings instead of in homes. The Council of Laodicea in 363AD actually forbade the love feast from taking place in church buildings. 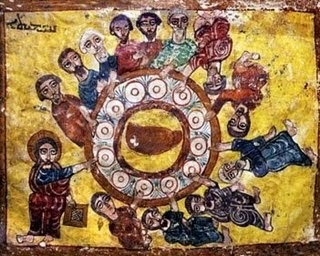 The council of Trullen in 692AD not only forbade love feasts but also the use of tables in churches! Thus the shift was complete entirely depriving the church of the blessing of face to face fellowship between the saints in the presence of God. This is why we meet around the table every week and let the rest of our evening flow forth from there. For those who attend institutional gatherings on Sundays and are not able to, I would highly recommend inviting other believers into your house during the week for a meal, communion and some table fellowship. It is a great blessing, relationship builder and reminder of what Christ has done for us. It should not be relegated to the margins or sacrificed for the sake of things that we deem to be more important or necessary.